L.A. PIE STORY: HALLOWEEN BOO! This Halloween, Noah wanted to be the Big Bad Wolf, not the one from Red Riding Hood but the wolf that huffed and puffed in The Three Little Pigs, he was very specific. I made him the wolf costume he's wearing - pointy ears, sharp claws, furry tail, and all. It was all a big hit with him, especially the face painting part. No, no, not by the hair of my chinny chin chin. Follow this recipe for Lollipop Pies, then swap out the filling for the pumpkin one below. One 9-inch double crust dough makes approximately 18 pies pops. 1 (2 roll) package of pre-made pie crust works perfectly in a pinch. 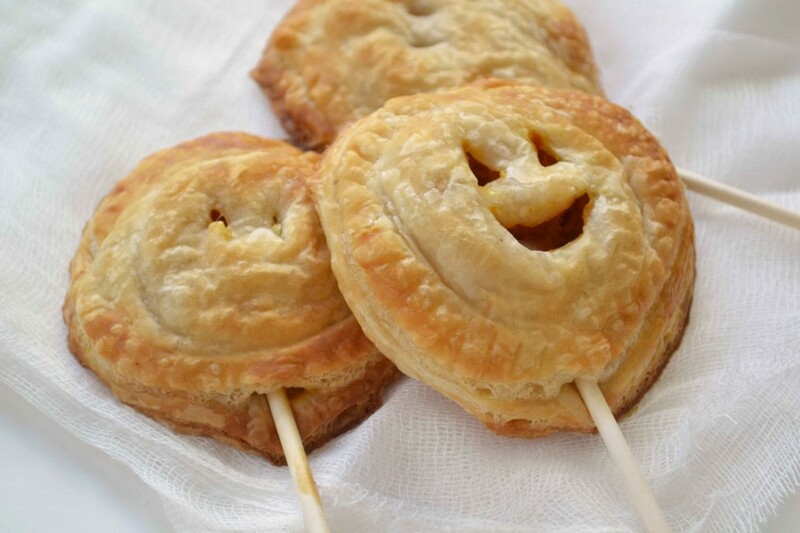 It's easier to cut out the jack-o-lantern faces on half the cut out rounds before assembling the pie pops but you can also using a sharp paring knife afterwards to gingerly cut out the eyes and mouth before baking. Please share how you did your wolf costume!